VETERAN farmers Rowan and Isabel Mengel believe it's now up to the younger generation to save Australia's dairy industry. 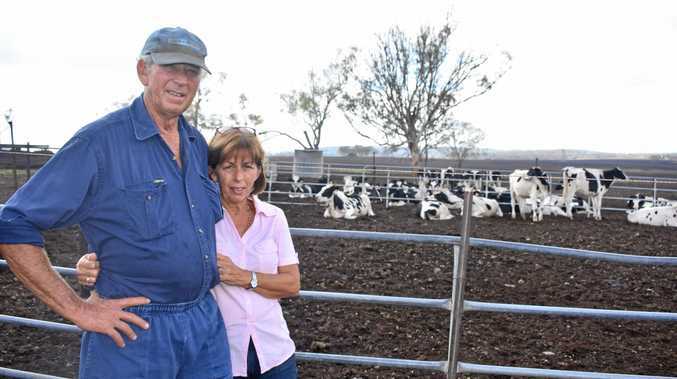 The Mengels have made the heartbreaking decision to close their 100-year-old Felton dairy operation near Toowoomba due to low milk prices and years of drought. 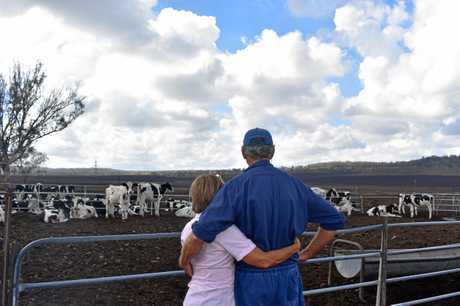 The couple hope the younger generation of dairy farmers will make enough noise that people will sit up and realise what is happening to the industry. When $1-a-litre milk started eight years ago, the Mengels lost $80,000 a year in income. "They (the government) said, 'Oh it won't affect the farm gate price' but within two weeks we had a knock on the door from Palmalat with a new contract for $80,000 less a year," Isabel said. "So it did affect the farmer and it's just not right." Isabel said the younger generation wasn't prepared to work for nothing. "I'm glad because they will make a lot of noise and I hope they make a lot of noise," she said. "Who would work seven days a week, 12 hours a day, for nothing? I think the younger generation want a reward and so they should, we all deserve a reward for our work. "Dairy farmers are usually very quiet and go about their business but these younger dairy farmers want something for their efforts and they're not getting it. So hopefully they will make enough noise that the politicians will pay attention." The couple told Rural Weekly last October they were hoping to keep 300-400 of their herd but ongoing dry conditions throughout summer has left them with no option but to sell all stock. When Rural Weekly followed up with Rowan and Isabel on Monday, they said once the last load of cattle went within the next month, they would have sold close to 900 head. "Nobody is buying, no one has any feed and no one wants to increase their herd," Rowan said. "So a really good breeding herd - they hadn't even started breeding, they were maiden heifers - have all gone to the meatworks. It's just wrong." Rowan made the life-changing decision to give up his passion and close the dairy in order to keep the farm, and said he would never go back to dairying. "There is no incentive to go back," Rowan said. "We've got no feed, all my cows are gone, the milk price hasn't changed, so why would you go back?" Rowan plans on growing hay and grain to support the farm in the future. However, without more rain, it may be a while before any crops are put in the ground. "I don't think Rowan will ever retire," Isabel said. "He's just waiting for rain but we need a hell of a lot more rain. "We need about six inches of very soaking rain. The ground is in very poor condition, it's very dry. "We've only had one inch so we can't plant yet. We're crossing our fingers and toes for more rain in the next few weeks." Rowan has been growing crops his whole life in order to feed his cattle. The Mengels have a few dexter cattle, which they will keep. "We'll mainly be focusing on crops," Isabel said. "Because that's what Rowan is good at, he's been growing fodder. So he's going to keep doing that, just not feeding his own cows." Isabel has been working part-time as a registered nurse at Toowoomba Base Hospital in order to help keep the farm going. "I had to," she said. "But this (farming) is all Rowan has ever done." Rowan said the couple were just keeping their heads above water when the weather was good because he could grow his own feed but it all went downhill when the drought started. "If $1-a-litre milk hadn't come in and we had been $80,000 better off then perhaps we could have survived the drought," Isabel said. "But with a hit like that $1 milk, then the drought, there's no hope." "Some of these townies don't know what's going on," Rowan said. "We were in Plainlands at the coffee shop and Issy grabbed the 600ml of water and it was $2. And Issy told the girl behind the counter. 'Water is dearer than milk'. "And the girl said: 'Well how could that be?' - she wasn't even aware of it." Isabel said Prime Minister Scott Morrison and Minister for Agriculture David Littleproud needed to "grow some" and stop processors and supermarkets from taking advantage of farmers. "The dairy farmers are struggling," she said. "They're not getting any help. They're living on the same wages they were 10 years ago. Costs have gone up. Everything has gone up except dairy farmers' income, that goes backwards. "Our government needs to stand up and be accountable, because they are destroying the industry."